I have seen Eurosonic's writeup in his build thread and the pic of Toasty's boatsides. I swear i saw others (at least one), but cant find them with the forum search or google. Any other writeups or pics? Are you referring to cutting the rear quarter panels off behind the rear wheels on a Gen2/2.5 to increase the rear departure angle? We did it to my 95, then raised the gas tank by dropping the tank out, cutting off the tank mounts and rewelding them back on higher on the frame, then remounted the tank. 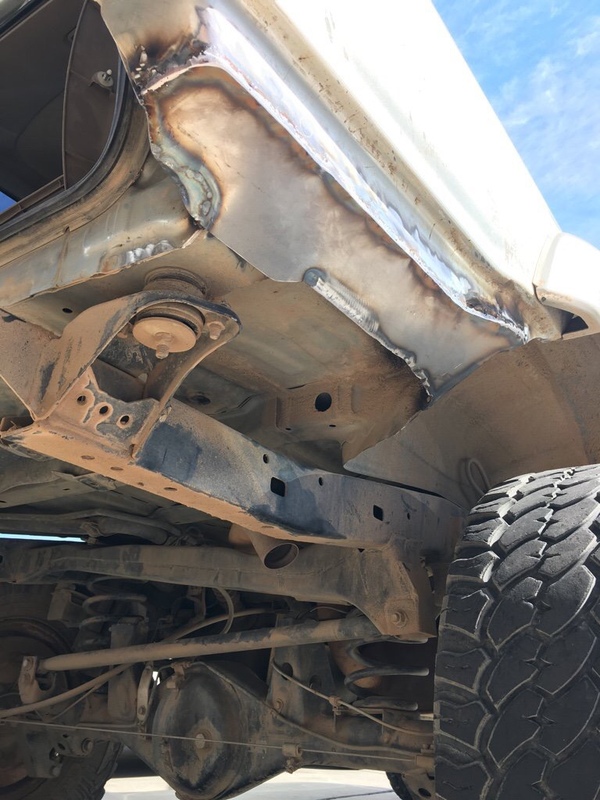 I stuffed fiberglass batting into the cavity left open by cutting off the panels to keep noise and dirt out and I covered the cuts (mostly) with my custom made bumper I got off a truck I bought from Justice Romero. 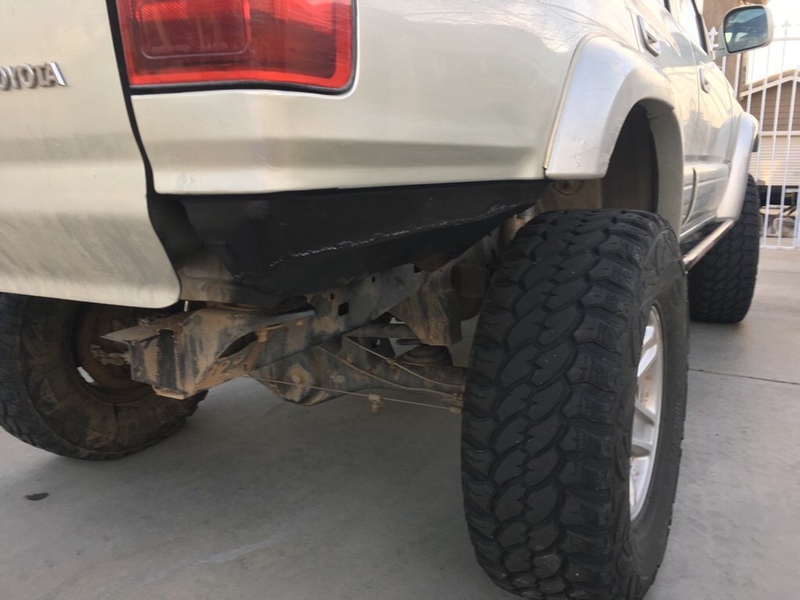 Then a week later, I took it to Mexico for a weekend and the Border Patrol asked me 20 questions about the modifications, took it over to secondary inspection, then drove it back behind a wall and presumably x-rayed the truck before letting me back across the border. Aside from that, it worked out great. I filled mine with spray foam. ( fun upside down) A very basic mod by todays standards that gets rid of lots of dragging. With other mods dang near any! Sealing is the most important step. Did not do mine right away and the dust and noise was horrific. Unfortunately, I did not. This was the first time I had ever done anything like this, or attempted this sort of thing so I went after the rear qtr panel with an Angle Grinder and a small 4" cutting wheel. I was having to cut at odd angles to get all the pieces off, whereas EUROSONIC used a sawzall and made very clean cut across. In doing so, he was able to create a clean line and cut out a piece of sheet metal to cap or cover and then bonded it, sanded, and painted and it looks very clean, professional. Mine, if you get up close and look behind the fender, you'll see a mangled mess that looks like someone lit an M80 underneath it. Truthfully, this is a simple procedure [simpler than typing out this advice]. i hear that this is a "simple" and "basic" mod. thanks for your thoughts on that. The drains referred to above are the rear sunroof drains. I went to the higher line mentioned above as well. I did this on my 4Runner. I did pretty much as everyone else described but fully welded the whole patch except some drain holes for the sunroof drain tubes. Then painted it over with Rustoleum bedliner.